Frederick's wife, Frances, was a social worker for the State of Arizona and did her field work in Yavapai County. When she would go out on an overcast day Frederick would opt to ride along. When he saw something interesting in the landscape, he would have Frances leave him there and return a few hours later when her work was done. 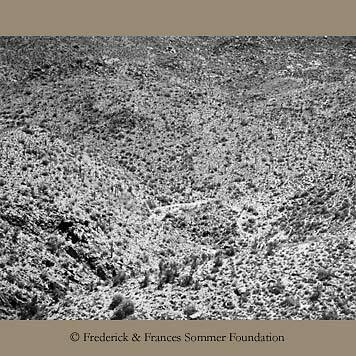 This gave Sommer time to create carefully composed and sharply rendered photographs of the desert landscapes about an hour or two south of his home in Prescott. Much has been made of the horizonless landscape in Sommer's work, what it offers the viewer and how it fits into the larger genre of landscape photography from Carleton Watkins to Robert Adams and Emmet Gowin.